UFC 229 promises to be the biggest - and most lucrative - event in MMA history. 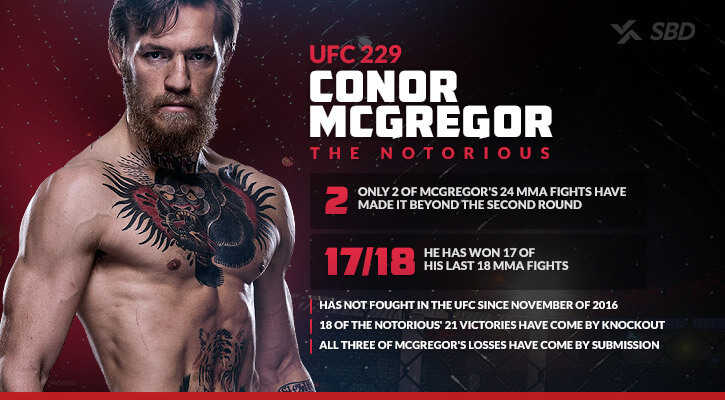 Two elite fighters, bad blood, and a thrilling stylistic match-up — what more could you ask for? It’s just a few more days until the biggest UFC event of the year, and likely the most lucrative night in UFC history. Conor McGregor makes his long-awaited comeback to the UFC, and he’s diving right back into the deep end. Welcoming him into the octagon is lightweight champ Khabib Nurmagomedov, an undefeated fighter who hasn’t lost a single round in his MMA career. How have the lines moved since the fight was announced, and what are the value picks when it comes to the props? Let’s get straight to it. Who Will Win the UFC 229 Main Event? The betting lines opened with Khabib as the clear favorite at -205, and while the champ is still favored, the line has shifted towards McGregor in the weeks leading up to the fight. Like with every Conor fight, it’s likely we’ll see late money pouring in from casual fans. If we strip away all the theatrics, the calculus of this fight remains simple and unchanged. McGregor is the greatest striker at lightweight; Khabib is the greatest grappler. McGregor operates in bursts and does his best work in the opening rounds; Khabib is a steady metronome of pain.